You cannot turn your back to eating a lot of spicy, greasy and acidic foods or chugging down plenty of soda and coffee, and that’s why you always end up with heartburn. And what do you do to put an end to that really uncomfortable sensation in the chest? Take some antacids. Did you know that the intake of lots of antacids is known to cause some unfavorable side effects? If you constantly reach for your trusted antacid after every meal, then this article is made exclusively for you. 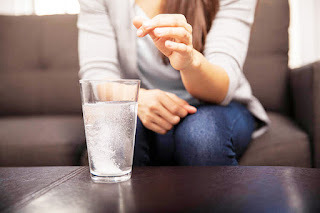 Below you will come across some of the nastiest health problems that you may encounter if you’re fond of taking antacids all the time — some of them can be really, really serious! Especially if your chosen antacid contains aluminum and/or calcium, it’s not unlikely for you to experience constipation. The said ingredients are known to cause the stool to harden, making it challenging for the bowels to be evacuated. According to experts, constipation may persist for as long as you are taking your antacids. It’s also possible for you to have frequent bouts of diarrhea if you are taking lots of antacids. Take a quick look at the list of ingredients — if it says magnesium, then you can blame your diarrhea on your excessive antacid intake. Usually, diarrhea is a temporary side effect of antacid intake, but it can happen with repeated use of antacids. You may experience muscle weakness and even twitching if it’s your habit to take lots of antacid after every meal. It all has something to do with the drastic changes in the levels of magnesium and calcium in your blood, both of which are electrolytes necessitated for the proper functioning of the muscles. Experts say that the severity of muscle-related symptoms is related to the dose and duration of antacid use. Because one of the most common ingredients of antacids is calcium, it’s not unlikely for you to suffer from what’s known as hypercalcemia if you are taking lots of antacids. According to doctors, hypercalcemia is a dangerous matter. That’s because high levels of calcium in the body can end up deposited in the inner lining of the blood vessels. When that happens, the supply of blood to the various organs of the body can become hampered, depriving them of much-needed oxygen and nutrients. Other than hypercalcemia, another problem that may strike if you are constantly taking calcium-containing antacids is the formation of kidney stones. Individuals who are diagnosed with kidney disease should stay away from taking lots of antacids because the kidneys are no longer fit to effectively remove their ingredients from the bloodstream. Is aluminum one of the ingredients of your preferred antacid? Then you may be at risk of one day suffering from the weakening of the bones, a condition referred to as osteoporosis. Doctors explain that aluminum tends to flush out bone-strengthening minerals like calcium and phosphorus. Antacids work by neutralizing excess acids in the stomach that can be blamed for heartburn. Unfortunately, the thing that antacid use gets rid of is necessitated not only for breaking down food, but also killing off harmful microorganisms introduced into the body via the diet. This is the reason why you may have a higher risk of infections if you are taking lots of antacids.